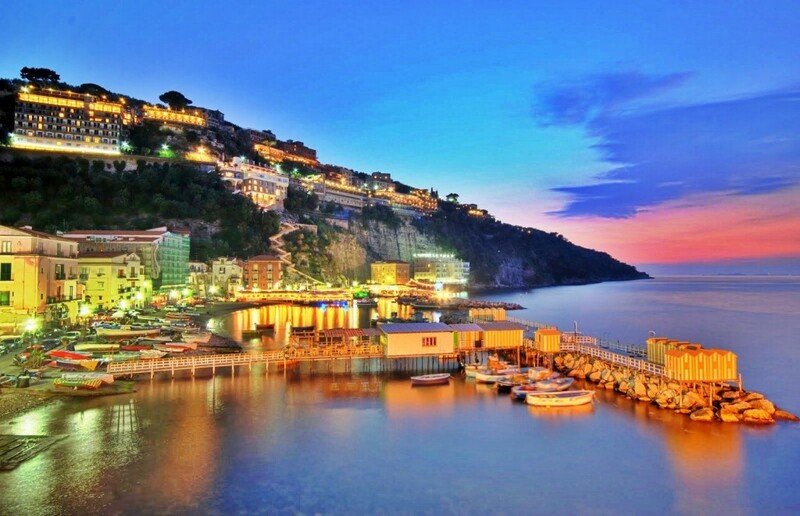 The town, in the province of Naples, is situated on the north west of the peninsula from which it takes its name and stretches on a high tufa terrace overlooking the sea from a height of 50 meters in the midst of lush greenery, surrounded by a beautiful landscape. It has always been an excellent tourist destination for its natural and artistic beauty, for its mild climate and traditions. It has often been the subject of legends and songs, such as the renowned melody “Torna a Surriento”, which has certainly contributed to its popularity in the world. Originally colonised by the Greeks, dominated by the Romans (remains of a magnificent roman villa can still be enjoyed), then a free ducal state, Sorrento developed during the XIX century all the traditional activities from agriculture to maritime trade and commerce and most of its tourism industry which nowadays represents so much of its economy. During the 19th century it was a favourite winter residence of foreigners and became an elite tourist resort. In fact the most prestigious hotels were built and they hosted czars and queens, writers, philosophers and musicians. The only parts of the old Greek town still remaining are some defensive walls. The Roman town was built over the Greek one following the same urban plain with walls of large stone blocks. There are many remains of Roman villas, as Villa of Pollio Felice and Villa of Agrippa Postumus. These walls stood to defend Sorrento through the Middle Ages. Rebuilding began in 1551 and was only completed in 1561 after the tragic Turkish invasion. The old town still shows the path of orthogonal streets of Roman origin, while to the mountain it is surrounded by sixteenth-century walls. Here you can find the Cathedral, rebuilt in the fifteenth century with a neo-Gothic facade, and the Church of St. Francis of Assisi, with a remarkable fourteenth-century cloister, with Arabian style arches on pillars that are interwoven orthogonal. The “Correale Museum” contains important classic and Byzantine fragments of marble, collections of Greek and Roman artefacts, paintings of the Neapolitan school of the XVII century and Capodimonte porcelain. Sorrento’s most illustrious son is Torquato Tasso, author of “Gerusalemme liberata”, the famous epic poem. Sorrento has dedicated its main square to this poet with a monument of him standing with his right hand resting on the book of his immortal poem. Sorrento is famous for the production of Limoncello, a digestive made from lemon rinds, alcohol water and sugar, and for creating stunning cakes, as “delizie al limone”. Other agricultural production includes citrus fruit, tomatoes, wine, oil, walnuts and olives and cheese, as the fiordilatte which is a stringy cheese, obtained through the fermentation of cow’s milk. Sorrento is also famous for its inlaid wood. This ancient technique is still used by the Sorrentine artisans giving life to fabulous works. Very moving and unique are the celebrations for the resurrection of Christ during the Easter period. These last a whole week and include the White Procession and the Black Procession characterized by a solemn and dramatic atmosphere. Sorrento is connected to Naples by the Circumvesuviana rail line. There are daily runs to Naples, to Pompei ruins and to the Ercolano ruins. The town can also be reached by public bus-line of SITA bus on the Sorrento-Salerno line with runs to Positano, to Amalfi and to Salerno. Ferry boats and hydrofoils provide services to Naples, Amalfi, Positano, Capri and Ischia.